Waterplay® Solutions Corp. expands its product line with two new aquatic play features for toddlers: the Twin Tot Slide and Bubble Trouble. Waterplay® Solutions Corp. introduces Bubble Trouble and the Twin Tot Slide, two exciting new aquatic play features. Both Bubble Trouble and the Twin Tot Slide are designed with the aim of engaging little waterplayers. Combining the beauty of falling water with the fun of pouring and dumping, Bubble Trouble can be featured as a main attraction, or as an addition to a larger aquatic play pad design. With multiple tiers for water to flow down, waterplayers will be drawn in by the interactive nature of the rotating columns, and can work together to keep water flowing continuously from bubble to bubble. With the introduction of the Twin Tot Slide, Waterplay offers a compact, standalone toddler flume with a gentle water effect. Including safety considerations such as anti-skid stairs, the Twin Tot Slide allows even the youngest waterplayers to experience the thrill of sliding at a pint-sized level. 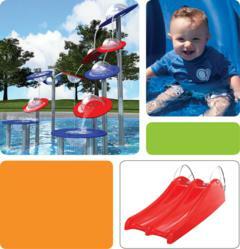 Bubble Trouble and the Twin Tot Slide are available now to enhance the play value of your aquatic environment design. Waterplay® Solutions Corp. is a global provider of premium aquatic recreation equipment. Add play to your project with Waterplay’s full suite of products designed to meet the needs of any aquatic project, no matter how big or small: aquatic play features, slide activity centres, waterslides, urban water features and water management solutions.